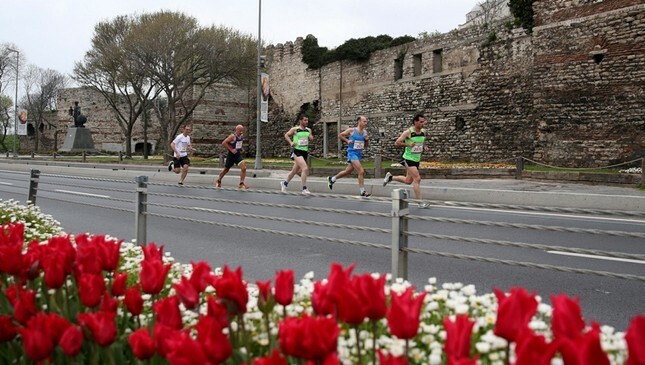 The Vodafone Istanbul Half Marathon, considered one of the best 10 half marathons in the world, will be held for the 14th time on Sunday, April 7. The advantageous early registration period for the half marathon ends on Friday. More than 10,000 athletes from almost 100 countries are expected to compete in the race, which is organized by Istanbul Sports Activities and Administration Trade Inc. Runners will compete in the categories of a 21-kilometer Half Marathon, 10K and Business Marathon. Athletes who want to participate in the run can register on the website of www.yarimaraton.istanbul for 50 Turkish liras during the early registration period ending Friday and TL 75 between Feb. 16 and March 29. Vodafone Istanbul Half Marathon reached the International Association of Athletics Federations' (IAAF) Gold Label for road races in 2017, boasting one of the smoothest and fastest routes in the world. With its matchless view of Istanbul's Golden Horn, the half marathon offers the opportunity for each runner to perform at his or her best with its zero-altitude track.